Kurt Holden is one of Wright State’s most respected police officers and a distinguished leader in the community. His commitment to being an honorable officer allows him to protect the university’s students, staff, and faculty with dignity and devotion. Holden’s colleagues say he is destined for greatness by virtue of his ethical leadership principles. One of Holden’s main passions is to enhance access, retention, persistence, and completion rates for former foster youth who become college students. He is in a unique position to realize his dreams as he himself is a former foster youth. His work with emancipated foster youth includes actively serving on Wright State’s Independent Scholar Network committee. He holds special assignments within the Police Department, including field training officer and officer in charge. 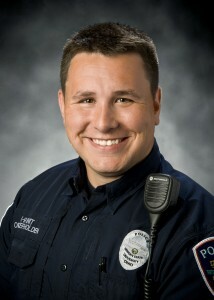 Holden also serves as a mentor to his colleagues and peers by serving as a Fraternal Order Police representative. Holden previously received the Wright State University Staff Diversity Advocate Award and the State of Ohio Blue Coat Officer of the Year award. His leadership qualities have also been recognized in the Dayton Daily News and The Guardian. On top of his community outreach and his service as a Wright State police officer, Holden is currently pursuing his master’s degree and encourages others to pursue higher education as well.